My wife was having a lot of problems with "her" minivan. I use the quotes as although it is "hers," I frequently drive it. It had the unofficial moniker of the SAGmobile as it often was the vehicle of survival when bike rides went awry. It was also a great consolidator vehicle for biking road trips as it could seat 6 people with 4 bikes on the back. The main problem was that the car just stopped running randomly. This became a safety issue as it happened while at highway speeds as well as just driving around town. This issue was seemingly unsolvable, even by the dealer on multiple occasions. It got to the point where my wife vowed never to spend another minute of her life in Chrysler's service department. 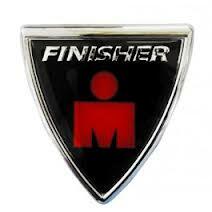 Am I breaking any sort of protocol by putting this on a car that I didn't own when I actually finished my Ironman? As this will be my wife's primary car, should it even have the emblem on it? While we waited for the new car to come in my wife was driving my car. She did comment that driving a car with a 140.6 sticker on it didn't concern her except when she pulled into her tennis club parking lot (with the gym attached). So, do I buy the emblem, wait for Santa to bring it for Christmas, or move on? Once an Ironman always an Ironman. I say display the emblem wherever you want with pride. Put that sucker on there! Your wife sacrificed a lot as well for you to go out and train, so I say Yea! I know when I crossed the line at my first HIM, I saw her and said "we did it!" Go for it. I put a 140.6 sticker on my wife's car too. You are a finisher no matter what car you have! :-) And if your wife is ok with having to say no I'm not the IM my hubs is then go for it! She's still a big part of your finish I'm sure and just as proud as you are! Dude, you earned it so display it. I agree go for it!